It doesn’t matter whether you’re just testing the job market or eagerly searching for your next gig—knowing how to write a great cover letter is an essential skill. We’ll talk about the whys and hows of cover letters, offer some examples of what to say (and what not to), and provide a few etiquette dos and don’ts. Read on to rev up your job-seeking game! Hunting for a job is hard. Completing online applications can be frustrating. Who needs to add a step to an already tedious process? We totally get it. And yet . . . . Even if you’ve got a killer résumé, even if you think your experience speaks for itself, writing a cover letter is a step you ignore at your peril. Unless, of course, you don’t really want that perfect job you’re applying for. The is when an employer specifically asks you not to include one or the application process doesn’t allow for one. At all other times, consider it a requirement. Cover letters do what résumés can’t—they tell a story that sets you apart from your competitors. Your résumé is a formal, fact-based listing of your experience and achievements; a cover letter allows you to showcase why those things make you uniquely suited for the job. It also conveys subtle insights into your personality that a résumé can’t. Think of it as an opportunity to promote yourself. A great cover letter should be as brief as you can possibly make it yet comprehensive enough to convey your potential for awesomeness. Your intent isn’t to provide a prospective employer with a recap of your work history (your résumé should accomplish that), but to intrigue the hiring manager enough to offer you an interview and, hopefully, a job. Ask anyone who’s ever been in charge of hiring—most cover letters are generic and dull. A few are amusing only because they’re so . If you want your cover letter to stand out, put energy into making it not only unique but also geared toward the company and position you’re applying for. Let’s look at the components of a great cover letter step by step. Here’s a cold hard fact: it’s difficult to impress a prospective employer when you begin a cover letter with Dear Sir or Madam or Dear Prospective Employer. Of course, many job listings provide no information and offer nothing more than a catch-all email address like [email protected] Helpful? Not so much. Read the job listing carefully. If you scanned it in your rush to apply, slow your roll! Many potential employers, intentionally or otherwise, embed important information in the depths of a job listing. Some may even ask you to include a word or phrase in your cover letter to make sure you were paying attention. Scour the company website. Look for a Contact or About Us page. Do you see the hiring or human resources manager listed by name? Bingo! Make a phone call. If you can track down the company’s phone number, simply make a call and ask for the hiring manager’s name. Here’s a tip: If the company doesn’t have a hiring manager, address your cover letter to the head of the appropriate department. If there’s no hiring for that email marketing associate job at Stellar Widgets, you could track down the marketing manager instead. Check social networks. LinkedIn is a great resource. Simply search with the company’s name to find out who works there and what title they hold. Once you’ve gone to the effort to track down a name, check and double-check to make sure you’ve spelled it properly. A typo could make you seem as though you lack attention to detail. Here’s a tip: In business communication, it’s customary to open with “Dear [Mr./Ms.] [Last Name].” If you don’t know the gender of the person you’re ing, use Dear [First Name] [Last Name]. If you happen to know that the person holds a PhD, use Dear Dr. [Last Name]. It’s important to write a few sentences explaining who you are and what you’re applying for, but don’t make it boring. A yawn-inducing opener like “Enclosed please find my résumé, tendered in application for the email marketing associate position at Stellar Widgets” could get your application shuffled to the bottom of the pile, destined to receive a templated “thanks but no thanks” letter. Oh, and “best of luck in your future endeavors,” champ! Be direct, but don’t forget to be personable and show excitement. Your goal is to craft a couple of punchy sentences that say who you are, what position you’re applying for, and why you think it’s a good match for your talents. When I was eleven years old, I created The Carver Elementary Gossip. It was a humble newsletter that I wrote and edited, then printed on my mom’s old Epson. I sold copies for 50 cents and even sold classified ads for a dollar. I’d made 85 bucks before the principal found out and shut me down, but not before she complimented me on my ingenuity and creativity. That hunger to create and innovate never left me, and it’s with that drive for success that I come to you with my application for the email marketing associate position at Stellar Widgets. The Balance offers of powerful opening lines. The Muse has . Highlight a major accomplishment. If there’s something you’ve accomplished that aligns with needs the company expressed in the job listing, highlight it. Focus on keywords. Larger companies use keyword tracking to help them sift through applications. Identify keywords from the job listing and make sure you let them shine in your cover letter. Here’s a tip: Find keywords that are important to the hiring manager by using a word cloud generator like or . Leverage your networking skills. if you were referred by someone who already works for the company, mention them. Don’t just name-drop, call attention to why your thought you’d be a fit for the job. Here’s a tip: If possible, get a feel for the company’s culture. Bigger companies might have a Careers page that will offer valuable insight. Even a company blog can provide clues. Are they businesslike and formal? Hip and edgy? Mirror their style in your cover letter. Remember, this paragraph isn’t for rehashing your résumé, it’s for highlighting your strengths and accomplishments. Focus on what you have to offer the employer. What needs do they have that you’re eager and qualified to fill? Here’s a tip: Trick your mind into helping you write confidently by telling yourself that your potential employer already likes and respects you, and that you have nothing to prove. Even if the employer has never met you, pretending you’re winning the game can have a powerful effect on your subconscious. There really is value in ! Although your cover letter is no place for modesty, it’s important to put your money where your mouth is. Give concrete examples of your successes. Don’t just say you’re great at writing marketing copy, show it. I’ve always been fascinated by what it takes to hook people with compelling writing and brand storytelling. I’ve worked as an email campaign copywriter at Grizzly Gadgets for the past two years, and my most recent campaign earned a whopping 62 percent open rate and a 23 percent click-through rate. My efforts contributed to a team that exceeded its ambitious customer engagement goals by 220 percent last quarter. It’s best to keep your cover letter on the short side—what a great way to demonstrate that you can focus your thoughts without rambling!—but if you have any skills that are essential to the position you’re applying for, this is the place to call attention to them. For that email marketing job with Stellar Widgets, you could point out your experience with bulk email platforms and design tools. Here’s a tip: Look for skills keywords in the job listing. If the employer states that experience with Adobe Illustrator is desirable, and you’ve got those chops, make sure your cover letter states so. Keep it relevant—don’t brag about your 120 wpm typing speed unless you’re applying for a gig where typing speed is crucially important. Mention things like specialized certifications only if they make you better qualified to do the job you’re seeking. Not only do I love words, but I’m also enthralled by design. I’ve worked hard to learn the necessary skills to give the campaigns I craft a compelling message and an eye-catching visual style. I’m a wizard with Adobe Illustrator, if I do say so myself. I know my way around bulk email platforms like Constant Contact and MailChimp, and I’m also a quick study with platforms that are new to me. It’s tempting to wrap things up by saying something like “I look forward to hearing from you,” but resist the urge to do it. You’ve put in too much effort to write a cover letter that doesn’t sound canned to blow it now! Your close should reflect your enthusiasm for your career. What do you love about the work? What are you fascinated by learning? Here’s the place to express it and show the employer that you’ve got drive and passion. And, of course, here’s where you ask for the interview. In my tool kit, I’ve got writing chops, an eye for visual design, and the drive to figure out what makes customers tick through data-driven analysis and A/B testing. I’m excited to meet with you to discuss how my skills and talents could play a vital role in the Stellar Widgets email marketing strategy. Here’s a tip: Wondering whether you should sign off with Sincerely, Regards, or Best Wishes? Here’s some advice. Here are a few things to remember as you’re custom-crafting your employment opus. Do focus on what you could do for the company. Remember that you’re not begging them to hire you, you’re showing them why they need you. Don’t be overly formal. In most cases, it’s best to come off as personable and real rather than stuffy. Do consider asking someone else to read your draft to make sure you’ve struck the right tone and that everything is stated clearly. Try if you need some extra input. 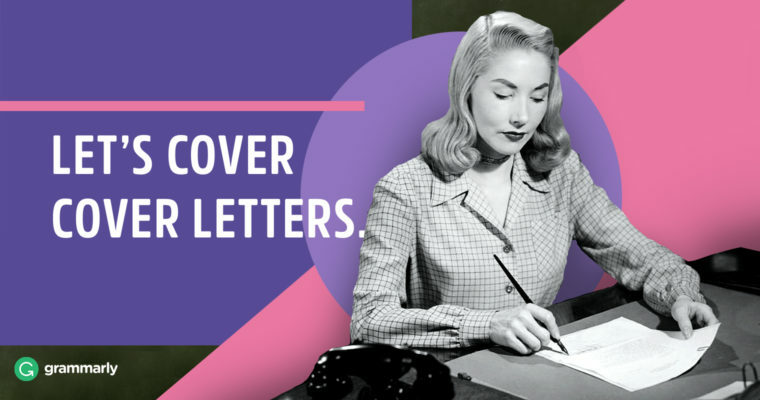 Don’t use the same cover letter for every job you apply for—customize it! It’s okay to start with a template, but make sure you customize parts of your cover letter to align it with the employer’s stated needs and interests. Do read your cover letter to yourself out loud. If you find yourself stumbling over anything, consider rewriting for clarity. Your cover letter is arguably the most important part of the application process, so be sure you invest time in writing one that shows off your skills in a way that a hiring manager can’t ignore. Demonstrate why the employer needs you on their team and you’re sure to score the interview.